There were a lot of things we could’ve talked about today. Last week, I had multiple friends suffer loss, which got me thinking again about the nature of grief and the transient randomness of life. Last week, my story “Her Hands Like Ice” appeared in Bracken Magazine, and it might have been interesting to trace its development: from a winter’s observation to published story. Last week, more terrifying things happened in the United States, which renewed my will to resist. Last week, I continued wrestling with difficult, painful thinking about Canada’s 150th anniversary—what, precisely, are we celebrating? Plus, I’m working through one of my biannual freakouts. I get one around October and one around February: like clockwork, every year. (Here is last February’s.) I’m fairly certain it’s linked to a mild seasonal disorder, which is comforting when I’m convinced that I’m a talentless hack with no future – it’s not Real, it’s linked to the light. So yeah. A lot going on. In the end, though, I think this is what I’d like to discuss. 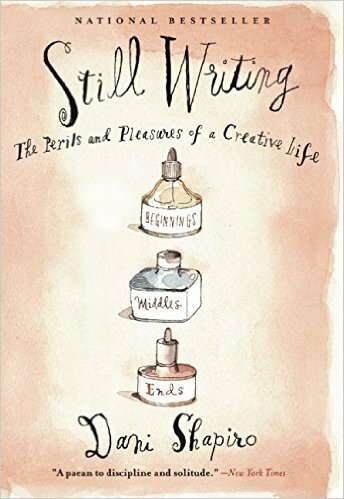 Last week, I read Dani Shapiro’s Still Writing: the Perils and Pleasures of a Creative Life. It’s part memoir, part hymn to writing and art. It’s a short book; funny and poignant by turns. But in one chapter—no, they’re more vignettes, really—in one vignette, she talks about work as being like meditation. The trick to both is this: you must notice when your mind has scampered off like a caffeinated squirrel, and bring it back to centre. Nothing more, nothing less. Simply coming back to that point of stillness, again and again and again. In a funny way, it makes me think of canoeing. Dipping your paddle into the water again and again. Developing a rhythm. And if you stop—distracted by mosquitoes, maybe—or alarmed by storm clouds—you simply breathe. Readjust your grip. Begin again. You do get to a point of stillness, canoeing. (Actually, I’ve got a lot more experience kayaking, but I think the principle’s the same.) The rhythm itself becomes a lifeline. How to you get across the lake? Stroke by stroke. Nothing more, nothing less. 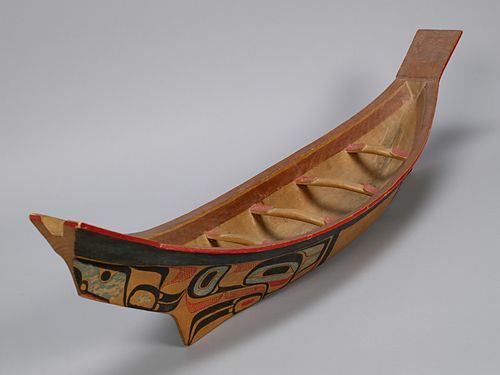 Tluu/Model Canoe, by Charles Edenshaw (Haida). Courtesy: University of British Columbia Museum of Anthropology, photographed by Derek Tan. All of which to say: I don’t know what lies upstream. There is a lot going on. But I know that I can put my paddle to the water. Again. And again. I got onto a musical kick this week, listening to Wicked and Moulin Rouge! for the first time in ages. “Come What May” has been on repeat – Moulin Rouge! is one of my very favourite movies. It’s wonderfully opulent, unabashedly sentimental, and utterly romantic: jewel-toned, like a Pre-Raphaelite painting. It’s so over the top. It works so well. Posted on February 6, 2017, in Writing and tagged Canada, creativity, fantasy, KT Bryski, writer, Writing, Writing life. Bookmark the permalink. 1 Comment.